Nia Robinson strikes a spike. The freshman lead the team with 24 kills against Rutgers on Wednesday. Symone Abbott did not emerge from Northwestern’s locker room Wednesday in her usual white and purple long-sleeve jersey. Instead, the Wildcats’ (13-10, 3-8 Big Ten) leading scorer was out with a leg injury and had to watch the match against Rutgers (5-18, 0-11) from the bench in a black jacket. Yet even without the senior outside hitter, NU still cruised to a 25-16, 25-16, 25-14 win at Evanston Township High School. Robinson did just that, recording eight kills to help the Cats cruise through the first set, which began with a 6-1 run. Rutgers closed the gap to 10-7, but that was as close as the Scarlet Knights got. As NU expanded its lead, Abbott jumped up and down and shouted encouraging remarks at every turn. Even after easily winning the first set, the Cats struggled to separate from Rutgers to start the second; the visitors were down just 17-14 at one point. A crucial kill from sophomore outside hitter Allie Lindroth gave NU an 18-14 edge and catalyzed an 8-2 run to close the frame. As the set wound down, the Cats appeared to get in the Scarlet Knights’ heads. During the run, a pair of Rutgers players both went after the same ball, but it landed between them and fell to the hardwood; one of the players who called for it gave brief side-eye to the other. Another Rutgers player yelled at the official after being knocked down on an NU block shortly after. The Cats never trailed in the third set and on their third match point a Scarlet Knight error secured the NU victory. Tashima paced the Cats with three aces, 43 assists and 10 digs. Robinson added a team-best 24 kills and chipped in two blocks. 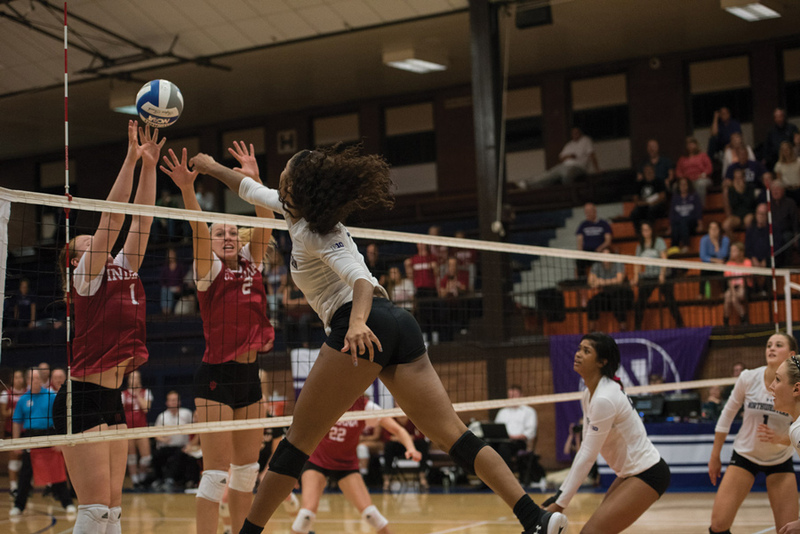 Robinson has been a mainstay in NU’s rotation all season and Wednesday’s match allowed her to show off why.